Our week had an amazing start as we were visited by Fossils Galore. 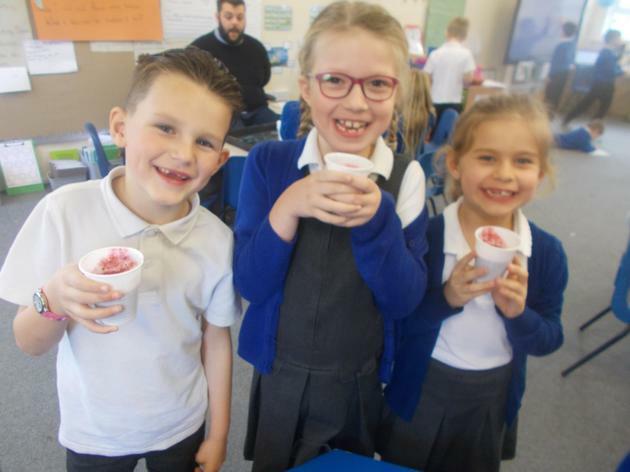 We had the most amazing time learning about how fossils are formed, where they can be found and how different species have evolved over time. 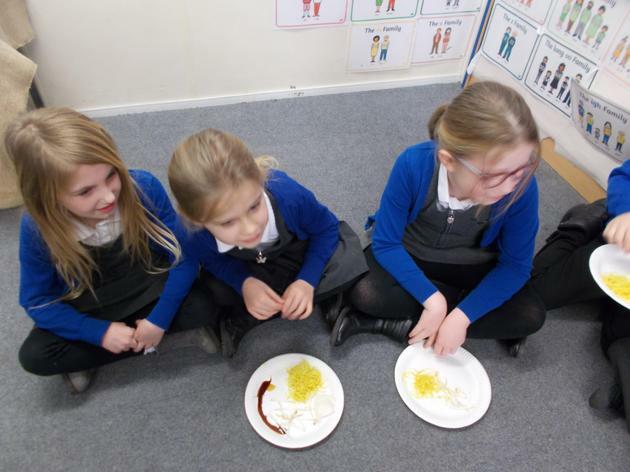 We were fascinated to find out that the closest living relative to the Tyrannosaurus-Rex is a chicken! We were able to hold so many amazing fossils and learn about the creatures that they have some from. We even held Coprolite- a particularly yukky fossil! 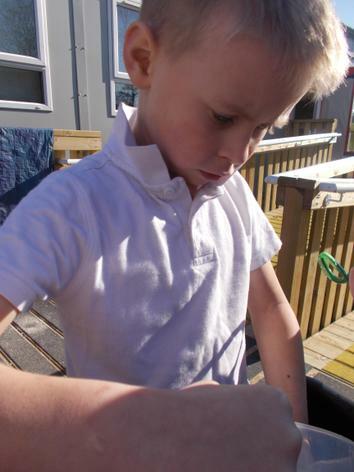 We then had a go sifting through the sand to fins our own fossils to bring home! We found some amazing things such as shark’s teeth, pieces of shell and fossilized wood! We had an amazing time and have enjoyed writing recount of our experience this week! This week the children are in control of the website again. They were tasked with sharing their learning through our page. "We have been reading the Gruffalo and our favourite character is the mouse because he is clever and cunning!" "This is where we have been pretending to be Charles Darwin on HMS Beagle. He was on HMS Beagle for 5 years! He was a scientist and he collected fossils, plants and animals. We made collection bracelets and collected plants just like him!" 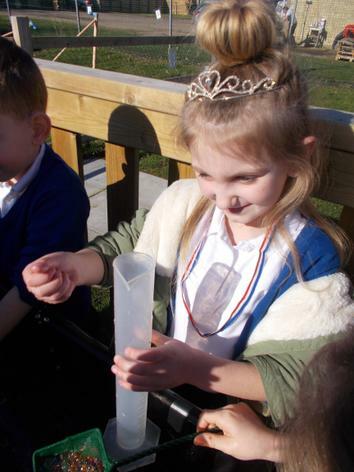 We loved science week, it was lots of fun. We learnt about food chains. We were pretending to be animals in a food chain. We wrote about animals in different food chains. We used the iPads and the laptops to find out about different animals in the food chains. We made food chains in the lego and in forest schools. We had lots of fun. 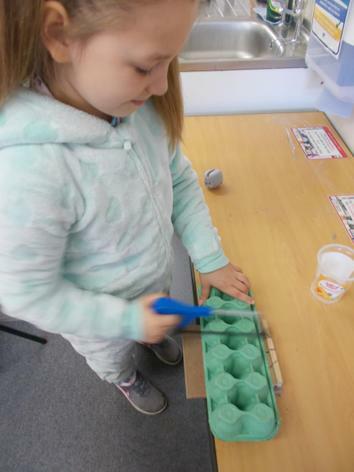 This week we have enjoyed creating out stationery holders in DT, we have used our ideas from our designs and have been sawing, sanding and using paper mache to achieve our desired effects. We have also been thinking of questions that we can use to evaluate our products. We decided that they should; be safe, be strong, have a place for all of the different pieces of stationery and look fantastic. We are excited to try out our finished products very soon! This week we have been writing 'What am I?' poems. We have been giving clues and our friends have been guessing what the item is. We have been thinking about fractions and have been working with friends to solve fraction challenges. 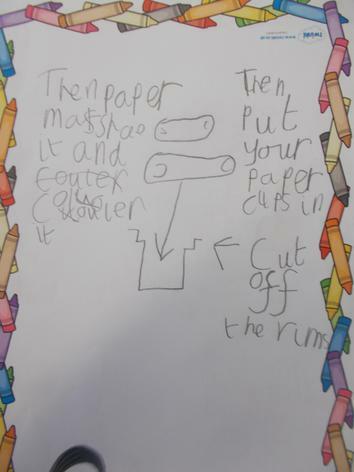 We have begun designing stationery holders using the rubbish that we brought in for our homework last week. We are excited to begin creating these next week. We loved World Book Day and had a great time discussing our costumes! This week we have been thinking about waste and recycling. We were really upset to learnt that plastic bags can end up in the ocean and that this can hurt or even kill wildlife. We decided that it would be much better if fruits and vegetables in shops were sold in paper bags as these are easier to recycle. We have written letters to the supermarket to suggest this because we think that we have a responsibility to keep the environment clean and tidy. 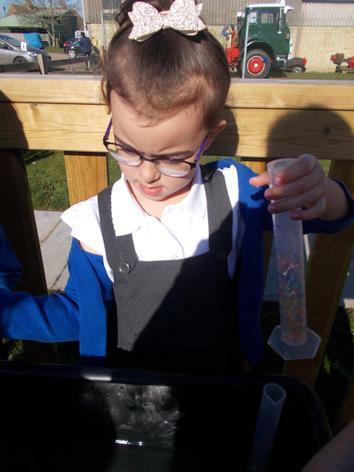 We have enjoyed exploring recycling and sorting the rubbish. We have been looking out for the recyclable symbol on the rubbish. 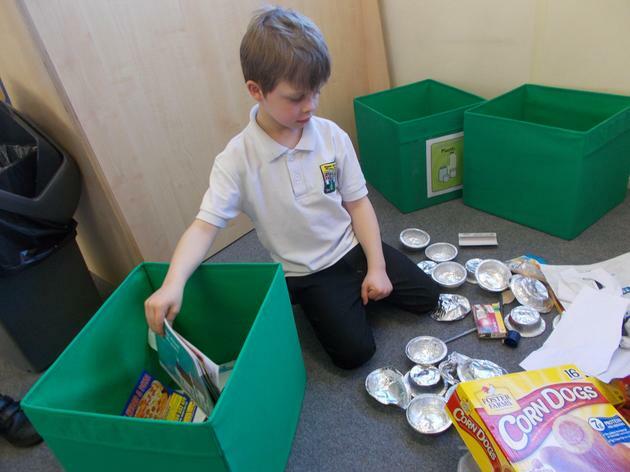 We have been thinking about how items can be reused and recycled and have been amazed by the process of recycling. 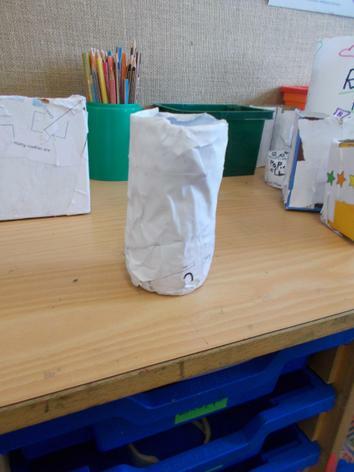 We have been creative thinkers and have been coming up with amazing ways in which we can recycle what others may call 'rubbish'. 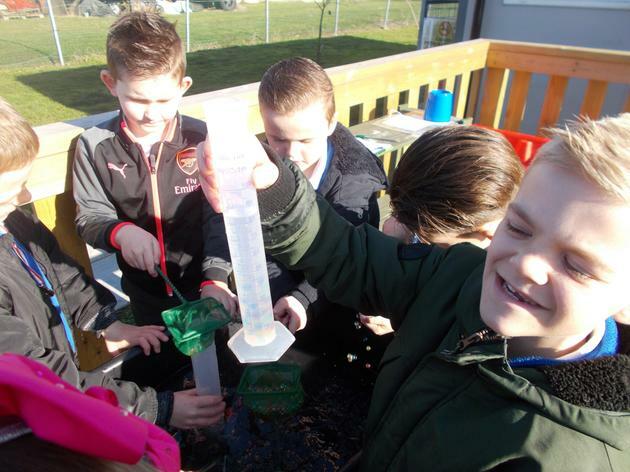 We have also been working on reading scales and measuring capacity. 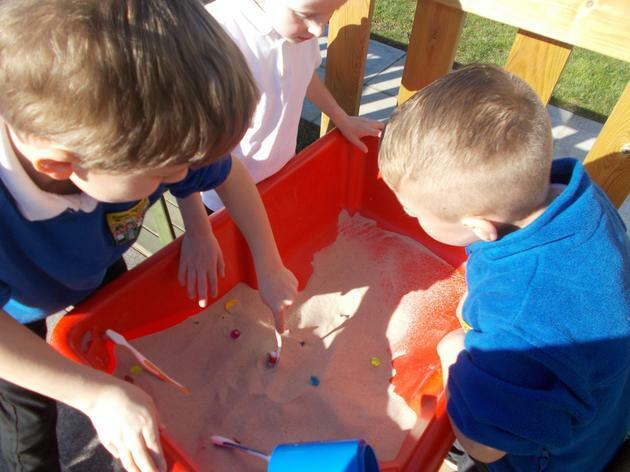 We have loved exploring this in the sand and water and have spent lots of time discussing our ideas with our friends. We have really enjoyed challenging ourselves during maths week. It has been really fun to show off all of our brilliant learning from this half term. We have also enjoyed finishing the stories we have been writing. We are really proud of these and have loved making them into real books! 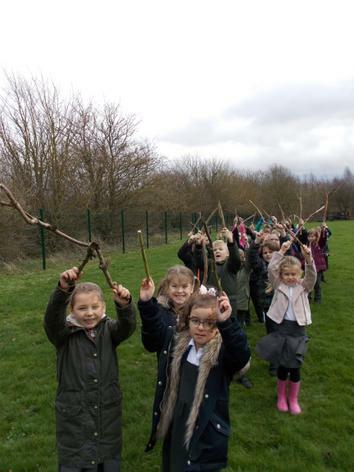 In our forest school session we made shaking sticks. We loved foraging for the sticks and adding beads to create instruments. 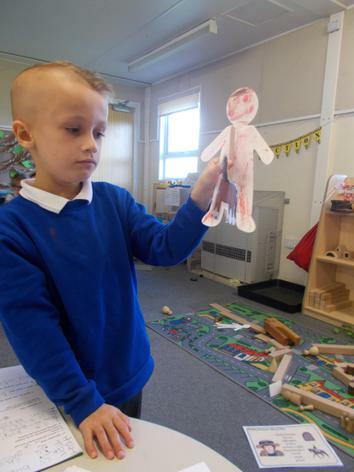 This week we have been continuing to add to our fantastic story. In our story the children ended up at a Chinese New Year festival. We enjoyed tasting and smelling Chinese foods. 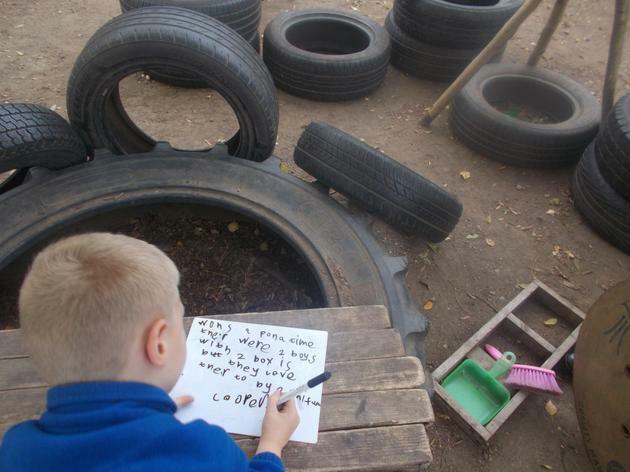 We then used this experience to add some brilliant adjectives to our writing. 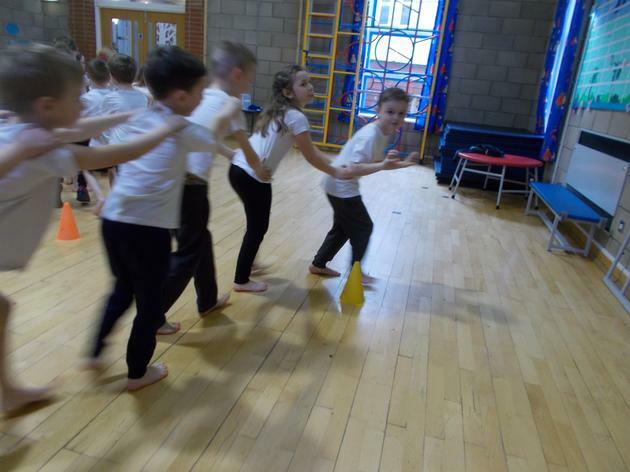 In our PE lesson we danced like Chinese dragons, we were fantastic at working as teams and we really looked like one creature instead of lots of children! We have been learning about money and have been building the same price in different ways. 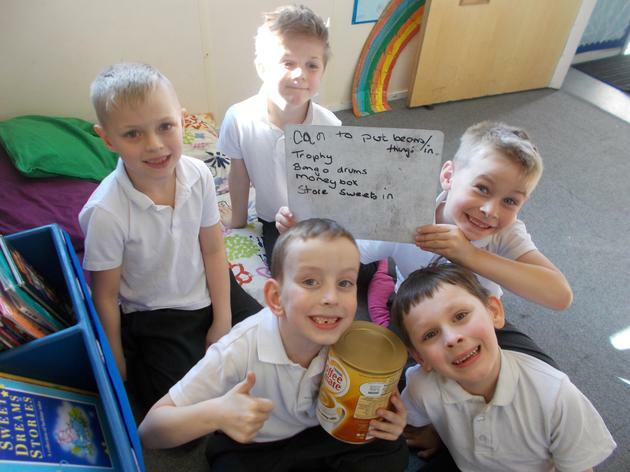 We enjoyed shopping for different foods in our class shop. We especially loved pretending to buy the ice creams! We are also very pleased to say that our bean plants are growing beautifully! This week we have been enjoying learning more about multiplication and division. 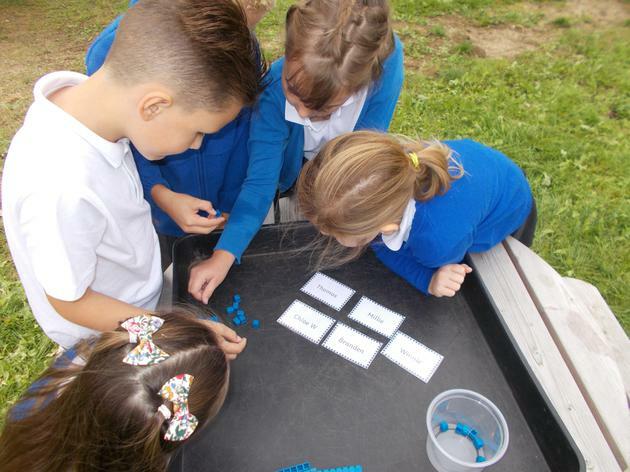 We have been learning about the relationship between the two and have been showing our understanding of 'number sentence families'. We have started to write a story about the Wishing Chair, based on Enid Blyton's book. We have enjoyed role-playing as the different characters. We have been making maracas in Forest School and have enjoyed making music with these. 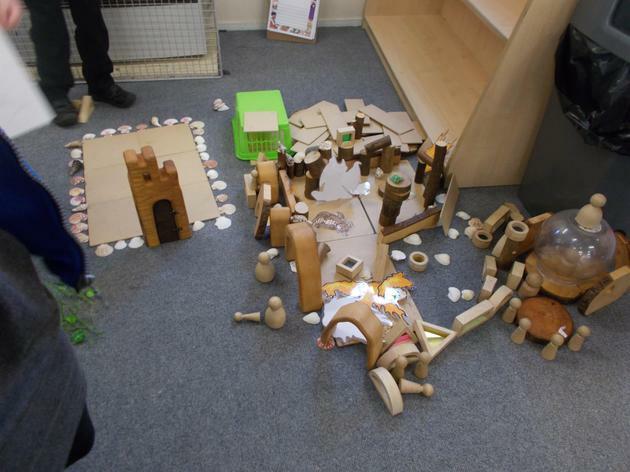 We have also been creating our own enchanted lands and have been thinking of amazing adjectives to describe these. Our plants have finally started to grow and we have been learning about how to take care of them. Thank you for taking time to come and see our assembly. We hope you enjoyed it! This week we have been focusing on the story ‘How to Catch a Star’ by Oliver Jeffers. 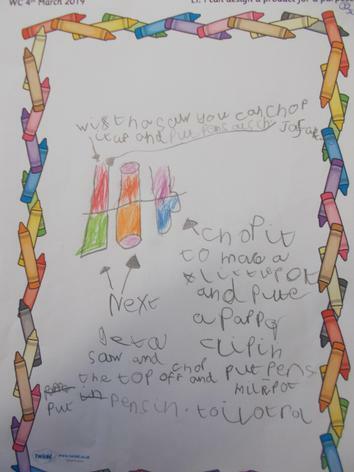 We have been writing instructions to tell the boy how to catch a star. 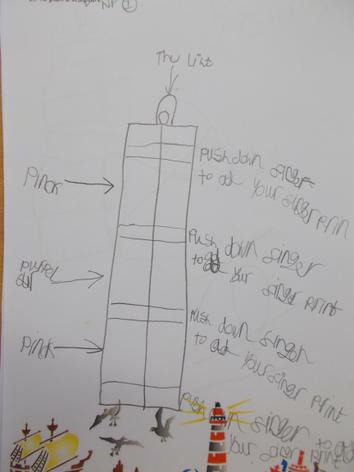 We came up with lots of fantastic ideas, including; standing on a skyscraper, jumping on a trampoline and using an enormous net! We have been working hard to make sure we use time words, like first and next, and to use imperative bossy verbs to tell the boy what to do. We have also been completing maths challenges about the boy. 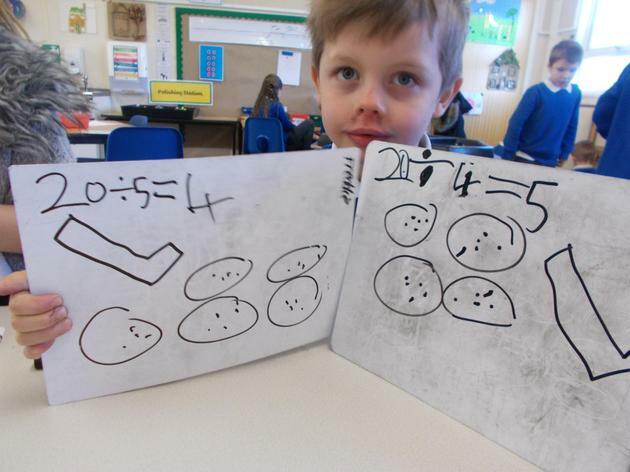 We have been using what we have learnt about addition and subtraction. We are becoming really quick at answering these. 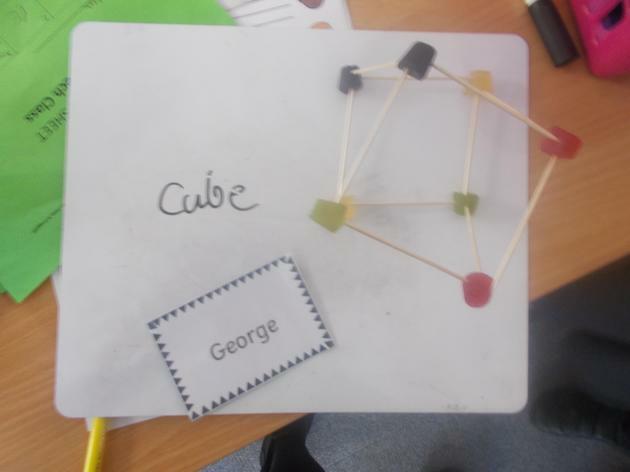 We have been learning about the properties of shapes and we have been giving each other clues to guess the shape we are holding by using our special shape vocabulary. In our science learning we have been thinking about plants. We have planted cress and beans. We decided to see what would happen to plants of they didn’t have; water, sunlight or warmth. We will let you know what we discover! 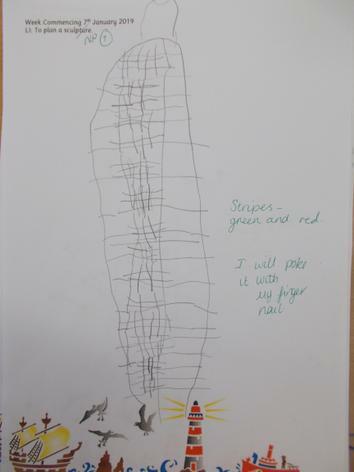 This week we have been changing the story of 'The Lighthouse Keeper's Lunch'. We came up with new ideas of how Mr. and Mrs. Grinling could solve their problem. After spending a few days exploring these ideas we began to write an alternative ending for the story. We really are a class of authors! In our maths we have been exploring the different ways in which we can solve subtraction problems. We have been drawing our sticks of ten and our ones and have been working on exchanging a stick of ten for ten ones. We have shown that we are able to persevere, even when something is tricky! During Forest School we created our own claves and we used these to create a pulse to help us practice our five times table. 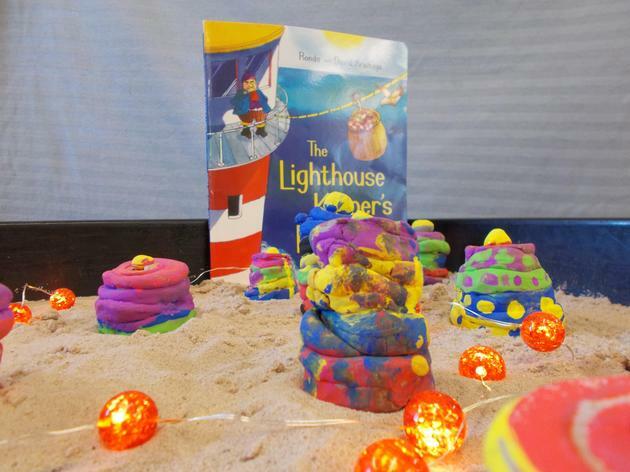 We have loved making our lighthouse sculptures out of clay, we used lots of different clay techniques to create them, even the challenging technique of coiling the clay. We have painted them in bright colours so that sailors would be able to see them easily. 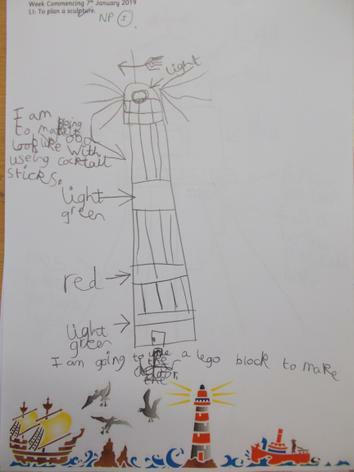 This week we have been thinking about the structure of the story ‘The Lighthouse Keeper’s Lunch’. 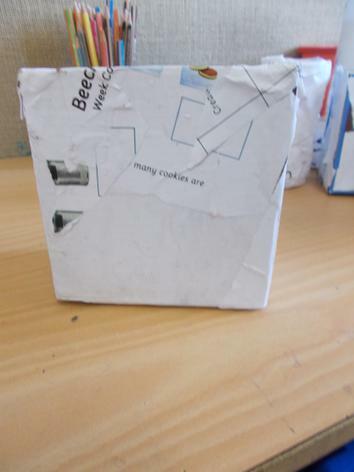 We have created story maps and have ‘boxed-up’ the plot of the story. We have been focusing on the problem and the solution within the story and have been challenging ourselves to find the problems and solutions in other stories. We have been thinking about addition and have been drawing our tens and ones to help us with this. 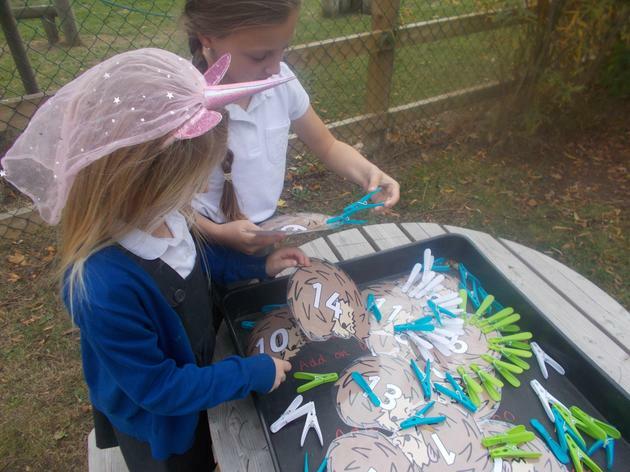 We have been working really hard on remembering to exchange ten ones for a stick of ten. We can even show this using actions. We have been preparing to create sculptures of lighthouses, we have planned our sculpture and have explored the different ways in which we can add texture. We really liked how the clay looks once you have pressed a shell into it as we liked the lines, we also liked the spotty pattern that we could create using Lego. This week we have been thinking about tally charts and block diagrams. We have loved collecting information about lots of different things and showing it in these ways. 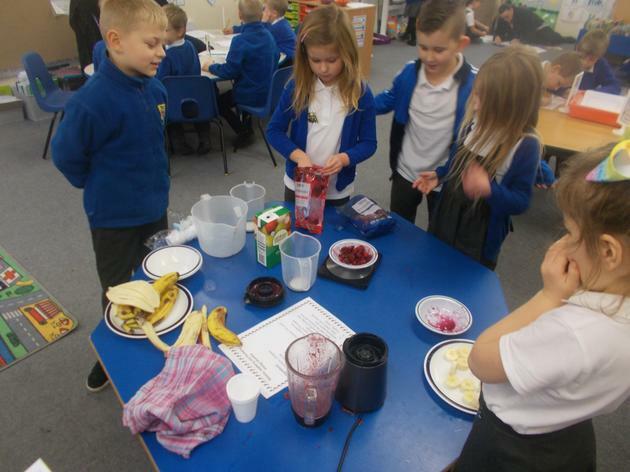 We found out about our friends favourite drinks, fruits, their eye colour and even the most popular shoe colour for grown-ups in our school. We have been thinking about lots of new words this week and have been working out what they mean. We have used picture clues, re-read the sentence and even used dictionaries to help us. 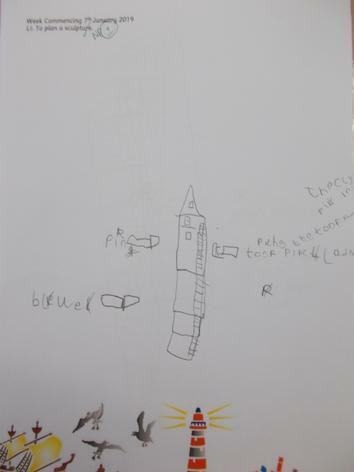 We have also been looking at different kinds of lighthouses, we have been talking about the parts that we like the most in preparation for creating our own lighthouse sculpture. This week we have been busy making our Christmas cards, decorations and calendars. 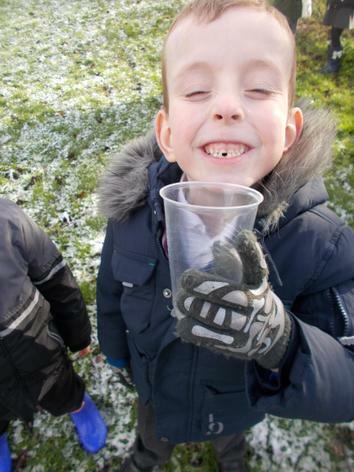 We loved making our dancing snowman cards and we hope that you have enjoyed receiving them! We have been thinking more about our rap and how we can perform this. We have been using our voices and actions to add even more expression. This week we have loved learning a rap/ poem all about winter. We discussed how we can use our voices to enhance our performance. We have performed the rap to a number of grown-ups who visited our class and they were all very impressed. 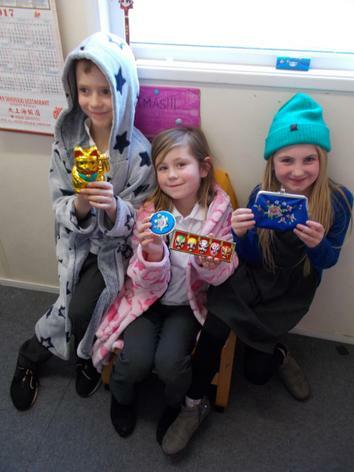 We have been using our problem solving skills in maths to solve Christmas problems for Santa, we have shown great persistence in tackling these rather tricky problems. In our forest schools session, Mr Lenton helped us to build a fire to cook jacket potatoes. 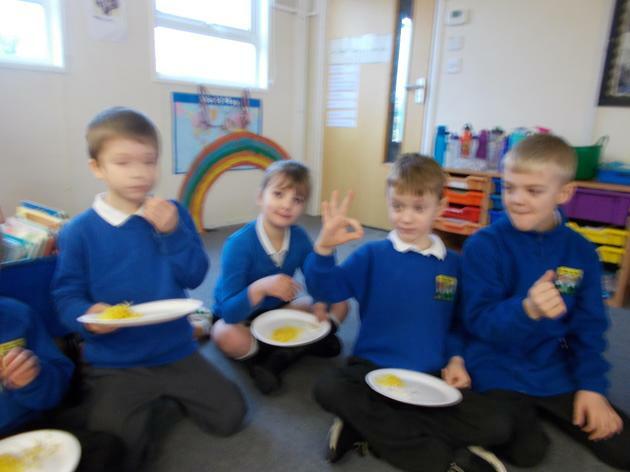 Even though it was a very cold day we cooked some delicious jacket potatoes and topped them with a range of different foods, inspired by our learning last week about healthy eating. Thank you to all those who came to see us perform our Christmas songs, we were pleased to share these with you and we were really proud of our performance. 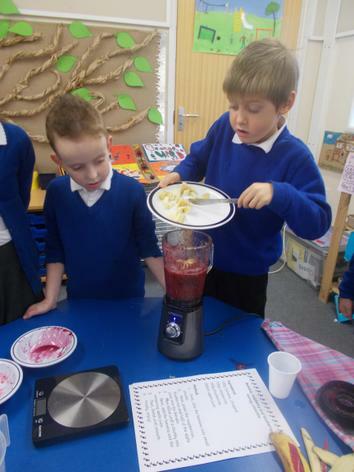 This week we have been learning about keeping healthy. 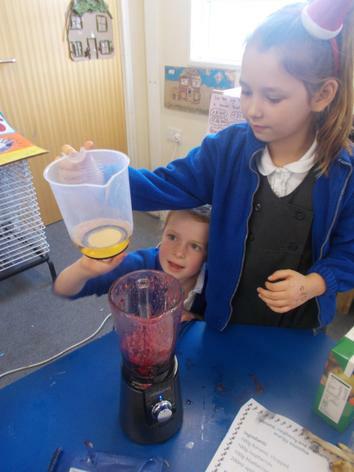 We started the week by making energy smoothies, packed full of fruit! We read the recipe and measured out all of the ingredients in grams or milliliters. 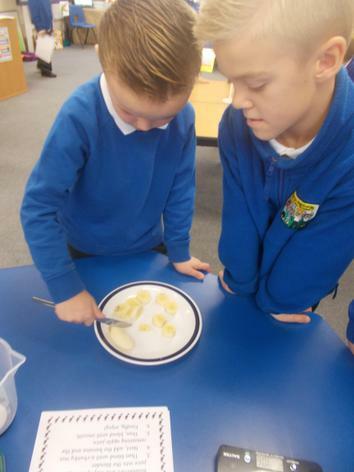 We have talked about how important it is to have a healthy balanced diet, we have used the Eat-Well Plate to help us plan a healthy plate of food and a healthy topping for a jacket potato. 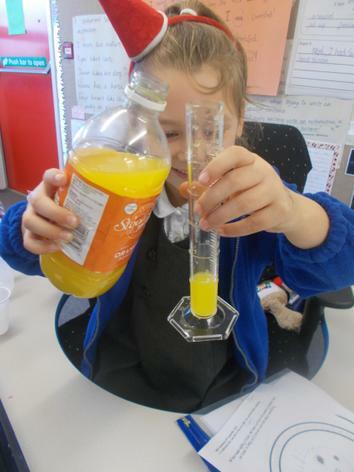 We have also talked about staying hydrated and have been measuring out squash and water to make drinks for ourselves and our friends. We tested our bodies in PE and explored how we felt before, during and after exercise. We have learnt why exercise is so important, we have learnt that it helps you to strengthen your body and can make you feel happy and calm. This week we have been learning about what animals and humans need to survive. We have been thinking about how to take care of animals and have written our own reports about this. 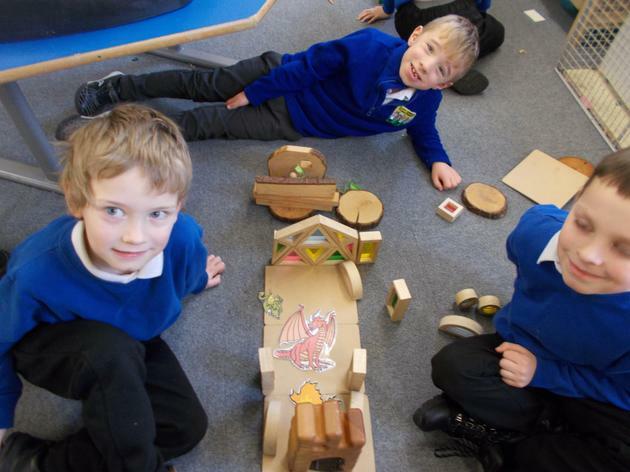 We have been building shelters for different animals. We have learnt that they all need different kinds of shelters. 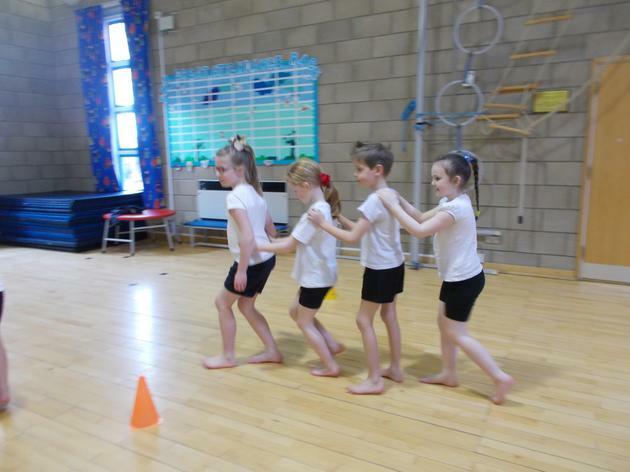 In PE we have begun to use equipment to enhance our gymnastics. We have been thinking of different ways that we can travel across benches. We have also been learning about time. We have built our own clocks and have been showing different times on them. This week we have been writing diaries, we have been pretending to be members of a family who lived in Manea in the 1900s. We have learnt that you must always write a diary in the past tense and you should write the most important information in the correct order. We have also been making films of a story called 'The Last Chip' which we have enjoyed. We used the iPads to film our friends acting out the story and adding their own exciting twists. We have been learning about division and have enjoyed challenging ourselves to answer the trickiest questions. 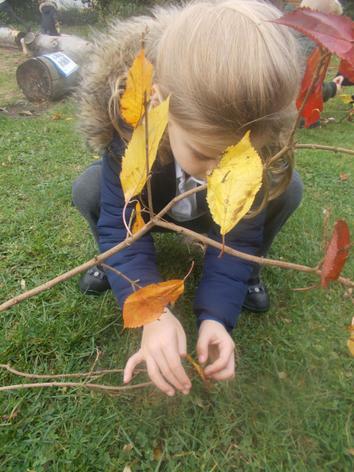 In our Forest School session we created sculptures from the items that we foraged. We worked in teams and created some very imaginative pieces of art work. This week we have enjoyed learning to challenge stereotypes. We focussed on stereotypes in careers. 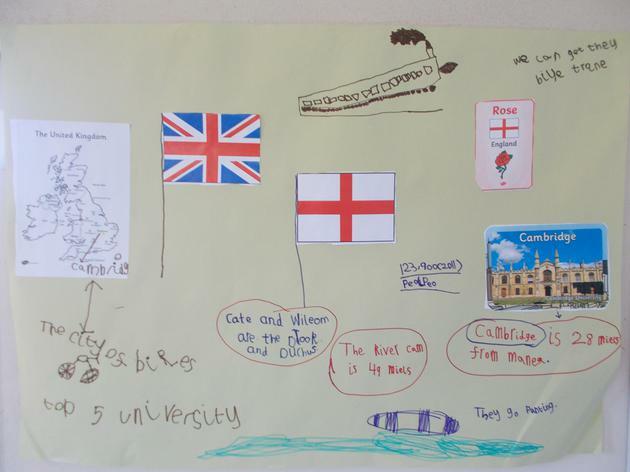 We learnt about England Women's football team and about male nurses. We enjoyed experiencing different careers through roleplay. We have been so excited to begin learning about multiplication! We built arrays using sweets to work out the answers to multiplication problems. We have also been talking about Manea Pit. We have been creating non-chronological reports and posters to tell people all about it and encourage them to go and explore! On Friday, we went for a ramble through the woods. We talked about the sounds, sights and smells. We think we may have even seen Pudsey Bear! 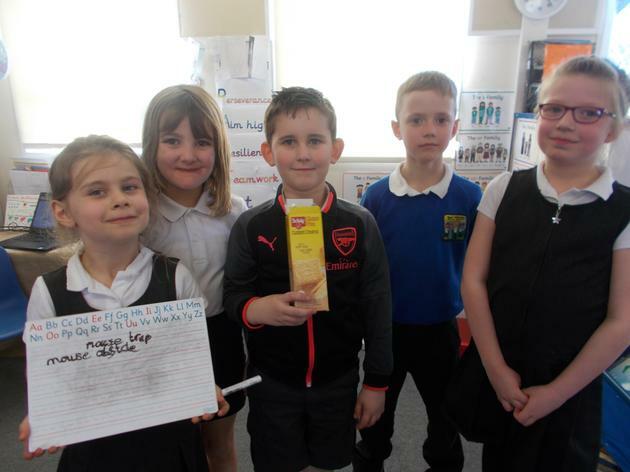 This week we have been learning about life in Manea in the 1900s. We were excited to learn about the life of people who lived on farms. We learnt that people had to get u very early and milk cows and that they used the cream to make butter. We decided to make our own butter! We shook cream up in a jar, which was very hard work, this turned into butter and butter milk. We then tasted our butter on some bread. It was delicious! 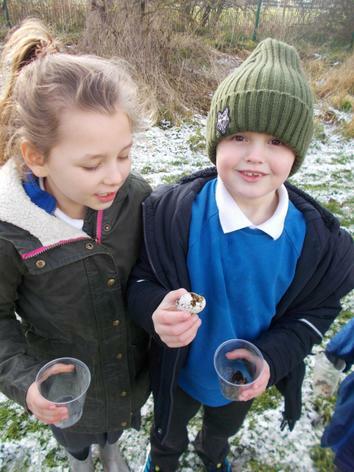 We had a lovely time during our forest schools session this week. We were making abstract art as a whole class. We talked about all of the things that we like about Beech class. We are proud that we are one big team and that we all support one another. We have been learning about less than and greater than in our maths learning. 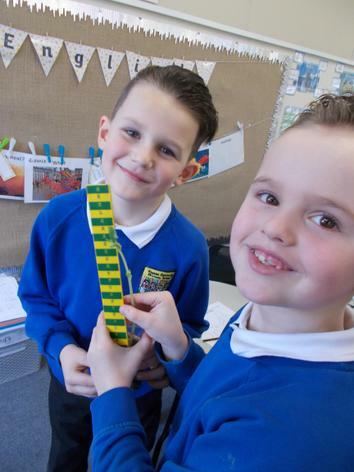 We loved making crocodiles to help us to remember that the crocodile eats the biggest number. We were treated to an amazing performance of 'Bonfire's Burning' by four of our very talented children. We were very proud. 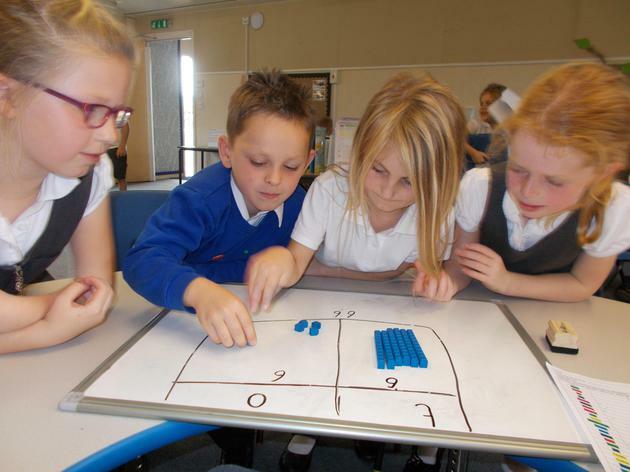 This week in Beech class we have been working on complex partitioning in maths. 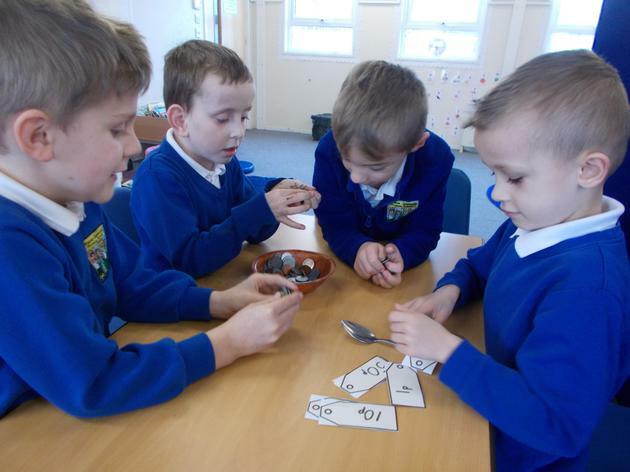 We like to call this 'Enchanted Maths', we cast spells on one another to help us split numbers up in different ways. 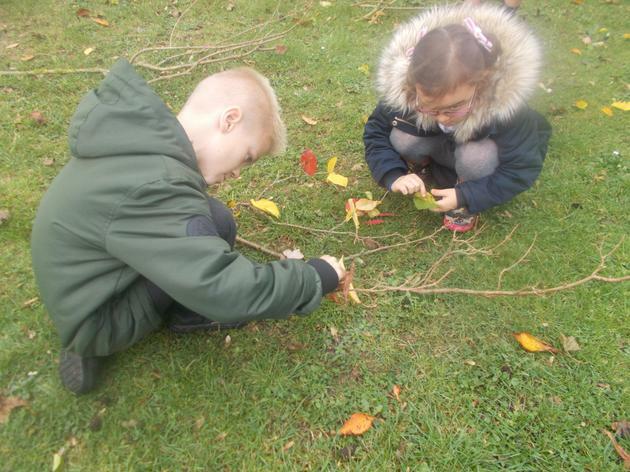 We collected sticks to transform into wands. 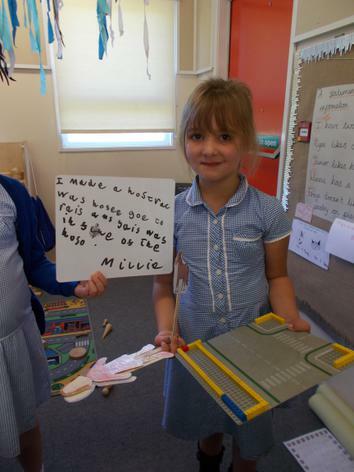 We have been learning which tense a sentence is written in and have been writing in the past tense. We have been working hard on our handwriting all week and we will continue to do this. We have been polishing and improving our work at our new polishing station. We even polished some of Miss Pritchard's work! We wrote some spooky acrostic poems and stories to celebrate Halloween. We loved performing our original acrostic poem for you in assembly! We have been learning about abstract artists, we have love recreating their work. We were particularly inspired by the drip paintings of Jackson Pollock. We have had a busy Friday! We have been learning all about the book 'Dear Zoo', we have been writing our own version, building zoos, writing letters to the zoo and making snakes using the clay! We have been very busy writing our own versions of the story ‘On Sudden Hill’, we have changed parts of the story and rewritten it. We have been talking a lot this week about perseverance, we knew that writing our stories would be a tricky challenge, but we didn’t give up! We kept working hard! We have been continuing to learn about fractions. 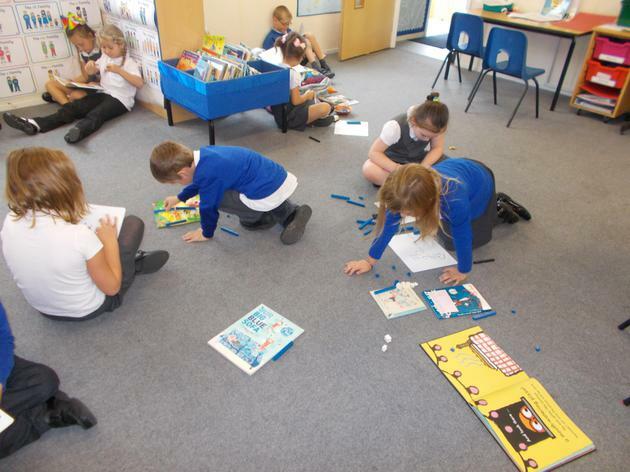 We have been building fraction towers in the Lego. We even answered some fraction word problems and we really impressed Miss Cole and Miss Pritchard with the fantastic vocabulary we used. We began talking about Piet Mondrian and looking at some of his art work. We had a o making our own abstract art in his style. 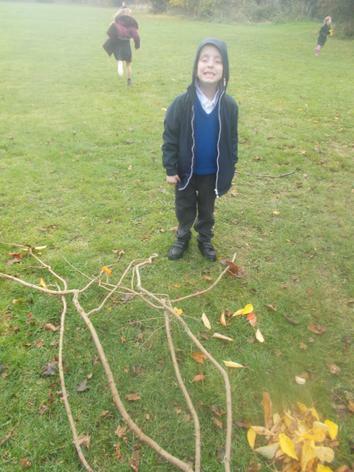 We had a fantastic forest schools session where we created artwork using natural materials. 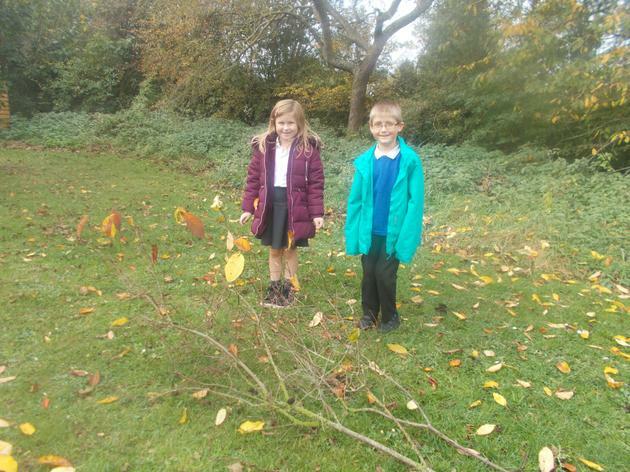 We found some enormous branches and we decided to use the autumn leaves to make trees. 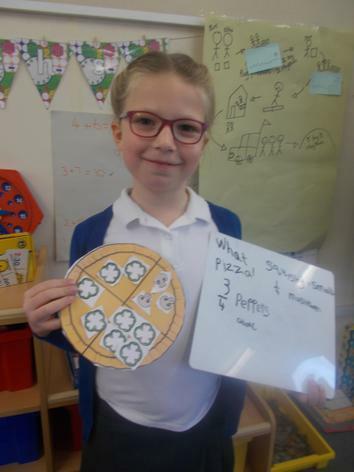 This week we have been learning about fractions. 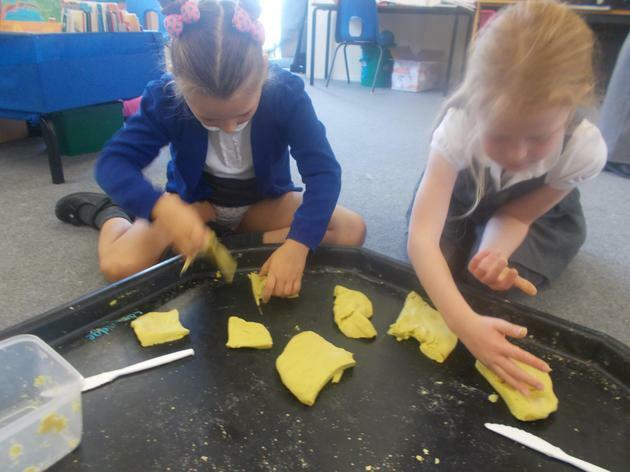 We have been making fraction pizzas using playdough and using paper. We have enjoyed talking about the fractions that we have cut. We have even begun looking at fractions of amounts. We have also been thinking about symmetry and drawing the lines of symmetry in 2D shapes. 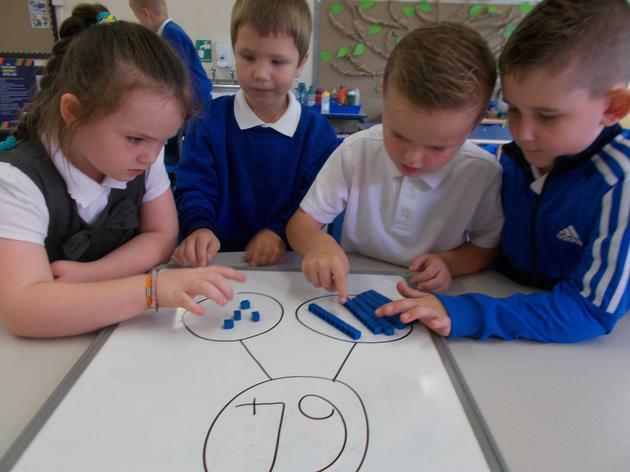 We have also been showing our understanding of the link between number bonds to 10 and number bonds to 20. 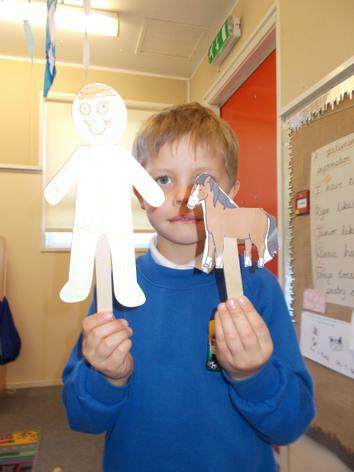 We have been learning to retell the story ‘On Sudden Hill’, we have added actions and performed it as a class. We have started to change the story and add in our own fantastic ideas. We are preparing to write our own versions of the story. 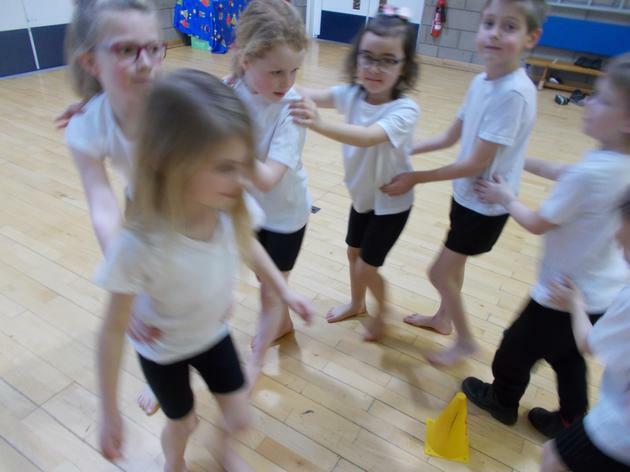 In PE we worked as teams to develop a dance based around a stimulus. We shared our dances with one another and talked about the parts that we liked the best. We worked fantastically as teams and showed our growth mindset skills. Thank you for the amazing collage homework that was completed over the last two weeks, it was lovely to see how hard the children (and grown-ups!) worked on these. I really hope you enjoyed the time together. 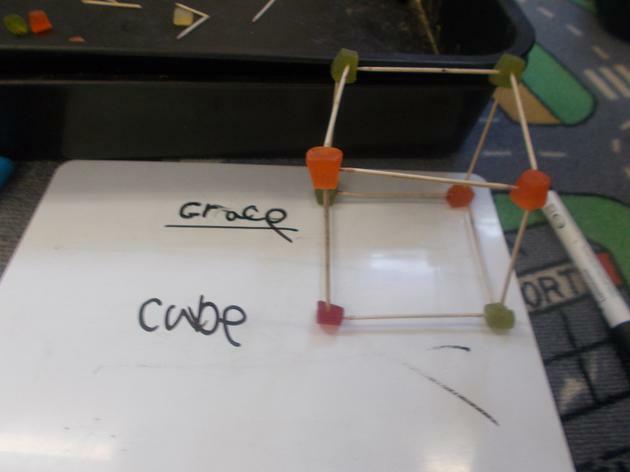 We have been learning all about 3D shapes this week. 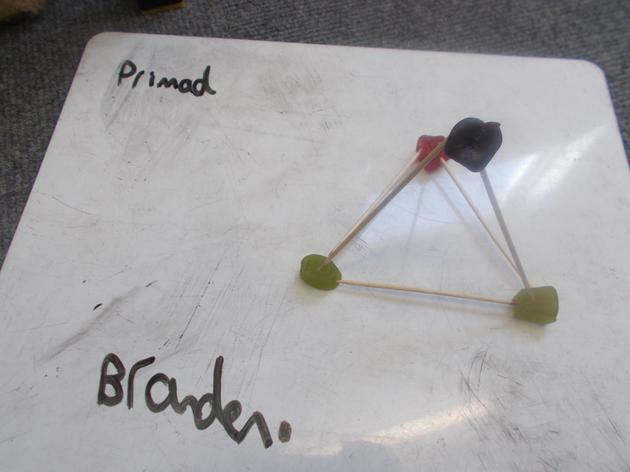 We have been learning about the properties of 3D shapes and we loved making skeletons of shapes using sweets and cocktail sticks. We used the sweets as vertices and the cocktail shapes for edges. 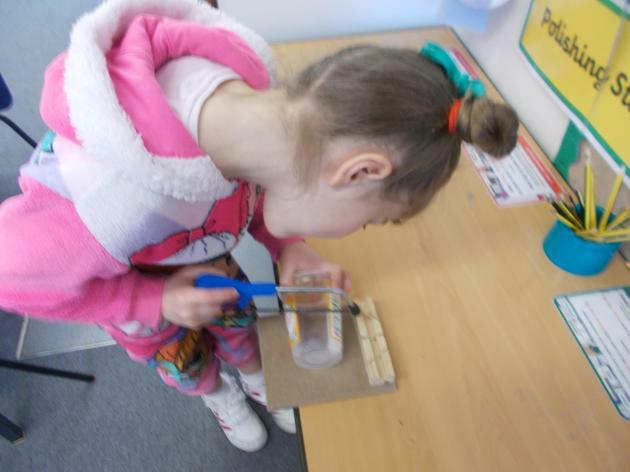 We have been thinking about waterproof materials in science. 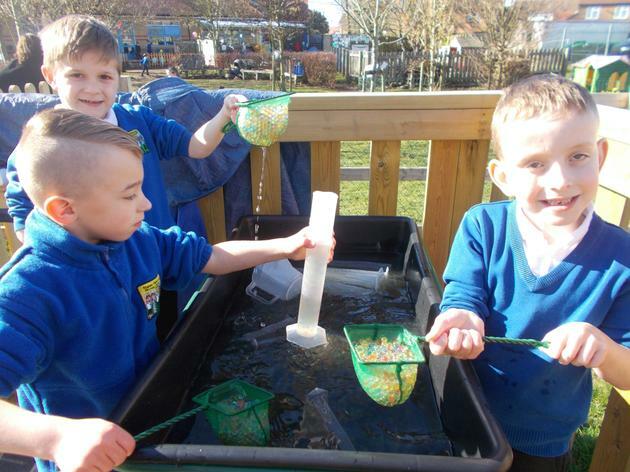 This week we have developed a hypothesis, which we learnt is the scientific word for an idea, about which materials we thought would be waterproof and which would not. 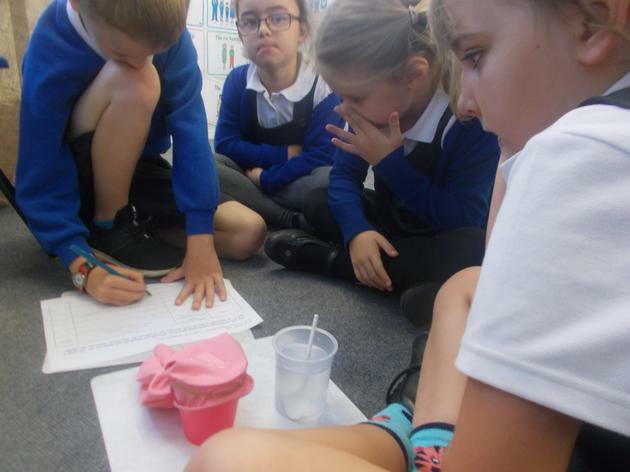 We then planned an experiment and tested our ideas. We worked together in teams and even when things were tricky we persevered. 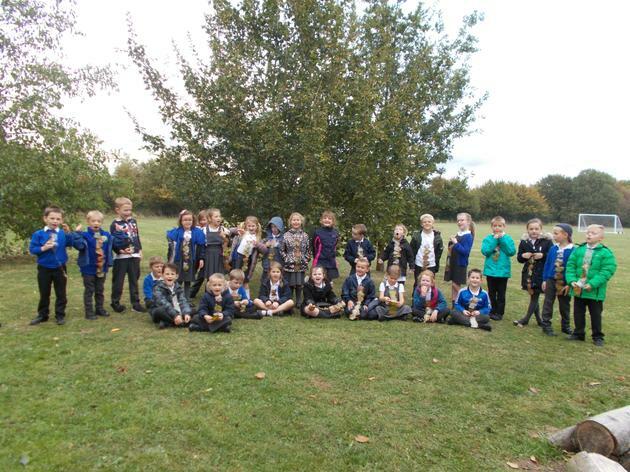 We went foraging during Forest Schools and we collected leaves which we used to make ties. We thought that we looked rather fancy wearing them! This week we have been learning about subtraction in maths, we have been using apparatus and drawing pictures to help us. We have been using our learning about place value to support our new learning. We have been learning about coordinating and subordinating clauses. We really impressed both Miss Pritchard and Miss Cole with our hard work and effort when showing this learning independently! We will continue to look at this next week. We have also been learning about the cities that our groups are named after, we have been making posters about these and sharing them with the rest of the class. We have been learning about the Suffragettes and in particular Emily Davison, we were really interested to find out the reasons why some of the Suffragettes were sent to prison. 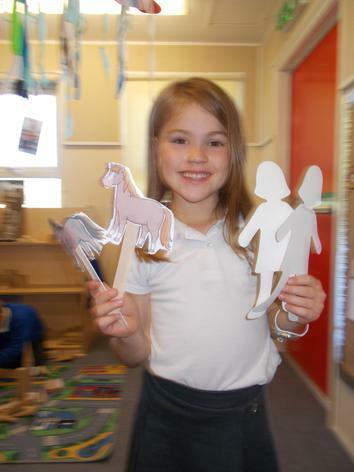 We made puppets of horses and Emily Davison and recreated the race where Emily tried to put a scarf on to the king’s horse which said ‘Votes for Women’. 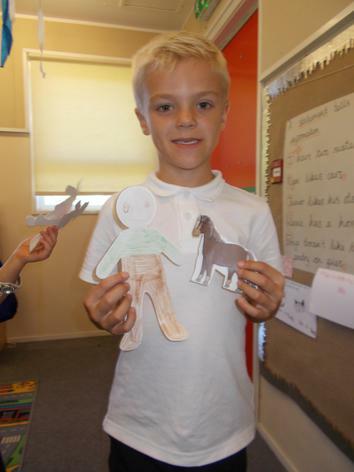 We learnt that Emily Davison, unfortunately, died from the injuries she got after being trampled by the horse. This week we have been thinking about different word classes. 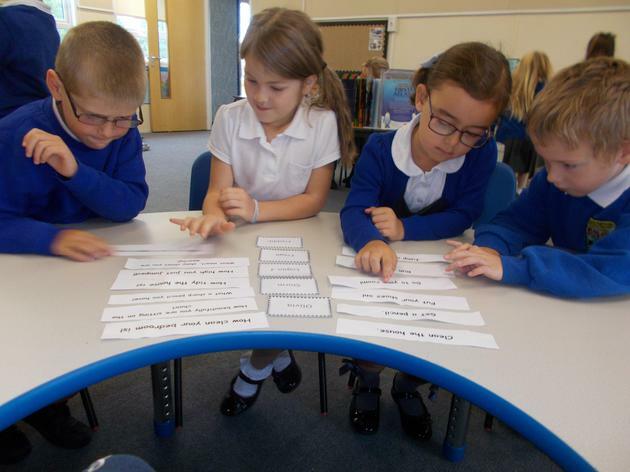 We have been identifying nouns, adjectives, verbs and adverbs in sentences and we have written sentences of our own containing different types of words. This half term we will be learning about the Suffragettes. This week we have been talking about all of the things that women were banned from doing over 100 years ago. We then talked about how many women and some men were feeling, we understood why they were feeling so cross and we agreed that it was unfair that men and women were not treated as equals. We decided to have our own protest to show our support for the Suffragettes. We made signs, sashes and even hats! Some said ‘Votes for Women’, some said ‘Votes for Everyone’. We marched around the classroom to try and imagine how the protesters would have felt. We have so many amazing talents and skills to share with our friends. We have enjoyed talking about how we can share our skills and talents with other people, we have thought about this when singing and playing along to a song in our music lesson. 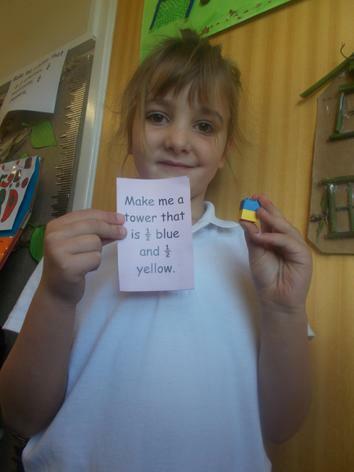 This week in Beech Class we have been learning about different types of sentences. We can now write exclamation sentences and command sentences. In our maths learning we have been thinking about place value. We have been building numbers using Dienes. We then drew representations of these numbers. 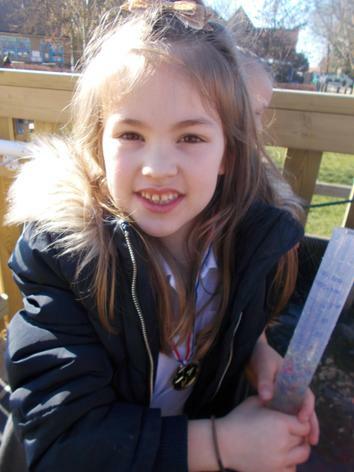 On Roald Dahl day we even used chocolate and sweets to build two digit numbers. It was very exciting! We have been revisiting our learning from Year One and have been creating maps of the world labeling the seven continents. We have started our PE lessons this week, we enjoyed moving our bodies to the Rhumba music! This week in Beech Class we have been exploring our new classroom. We have been working on our number bonds to 20. We have set ourselves a challenge to be ‘quick as lightning’ with our number bonds to 20 facts by October half term. We will need lots of help practising these at home. We have been learning about statements and questions. We wrote statements about ourselves so that Miss Pritchard could get to know us. 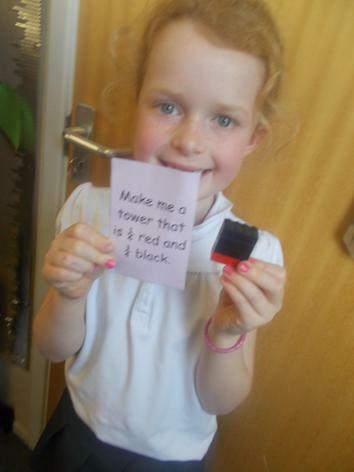 We have written challenges in the form of questions for YR and Y1, we think that they really enjoyed them. We have had a great first week and we are all excited for the learning that is to come!